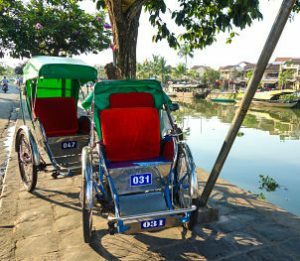 The easiest way to get around Hoi An is to hire a bicycle, electric bike or motorbike and if you need to go further afield, check out our list of car hire services. 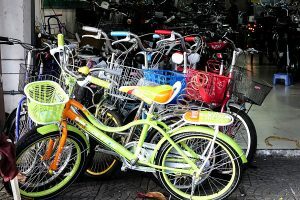 In this section you’ll also find details on: bus services to Da Nang and the airport, taxis, xe oms (motorbike taxis), boats, cyclos even how much to fill up your motorbike tank. We’ll tell you where to buy bicycles, electric bikes, motorbikes and cars. And if you’re someone using a motorbike who values their safety, check out where to buy decent motorbike helmets. You do not need a license to hire a motor bike but, if you have an accident and do not have a legal motorbike license, health insurers will not pay up. Check the fine print. It is the law that you wear a helmet and madness if you do not. You can sometimes get a better deal if you rent for more than a couple of days especially from the independent agents in the streets listed below. Filling your petrol tank should cost approximately 80,000 VND (depending on the size of course). Always keep your eye on the meter and see the section on ‘Scams’. Good English, new high quality bikes. To fill your tank costs around 60 – 80,000 VND; depending on your bike and the amount of travel you do this will last you close to a week. Why cycle when you can zoom along without moving a muscle. The electric bike is a nifty option for those unsure of their motor cycling ability. It is easy to manage, easy to ride and, boy, are they fun. Not heavy like motor bikes, you can zoom anywhere with ease but make sure the battery is charged. They are hellish to ride if the battery is flat. Yes, they have pedals but if you don’t want ten minutes to equal 25 hours at the gym, make sure your battery is charged. 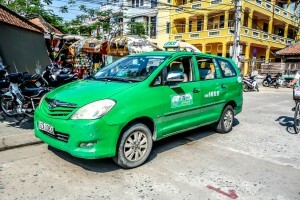 Taxis tend to be a safe bet with one of the two main companies: Mai Linh (green): +84 (0) 510 3914 914 and Faifoo (yellow): +84 (0) 510 3919 191. Finding one when you need one is not always easy, but they tend to hang out around the top of Le Loi St near the old town or across the river at An Hoi peninsular. Both companies use meters. All cyclos have number plates and are managed by the local police. A couple of years ago 50,000 VND per hour was standard, but these days drivers charge a lot more. A 15 minute trip from one part of the Old Town to another could cost as much as 100,000 VND. Negotiate! Consider avoiding the roads altogether and taking in the city from the water. For a trip down the river to the water coconut groves and back, expect to pay around 100,000VND per person. If going it alone isn’t your gig but you’d like to enjoy the adventure of life on a motorbike on the Vietnamese roads, try a Xe Om, or motorbike taxi. As Hoi An is a rather small town, you shouldn’t need to pay more than 25,000 VND for most short jaunts up the road, but from the Old Town to An Bang or Cua Dai beaches you should pay around 40,000 VND. Be aware that your safety is not always guaranteed on the back of these bikes so be sure to wear a helmet, try to avoid wiggling too much or distracting the driver, and do definitely voice your opinion if you feel the driver is going too fast or putting your life in danger. For your safest bet, look for the recognized Xe Oms in the collared pink shirts with numbers. Important! Agree on the price before getting on. Warning: Using Xe Oms during the day is very safe but a different breed arises after midnight.